This silk charmeuse has a sueded face with a dull, crepe back. 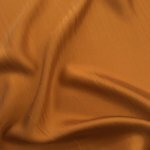 It is beautifully soft, opaque and has amazing drape. Use this for special occasion garments like dresses, skirts and blouses or gorgeous lingerie.